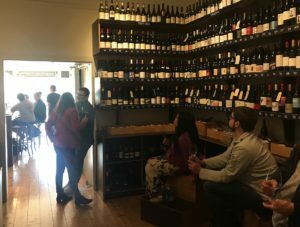 The WINE STORE | WINE BAR revolution has come along way in the past 10 years here in Melbourne town and now you can go and have a glass, some cheese or olives, and even a bottle at your local wine shop. This is what the Brunswick east Wine Store has offered this past 3 1/2 years and will hopefully offer for many years to come. But unlike all of the other WINE STORE | WINE BAR’S out there, we do not charge corkage to drink a bottle at the bar; what the retail price is well that’s what you pay. It maybe a Benjamin Leroux Meursault, Bindi Block 5, Astro Bunny Pet Nat or a quick an ace bottle of Harewood Denmark Rizza; whatever the price is, that’s what you pay – sounds like an echo right? As we say around here in the outer frontier of Brunswick East, “It’s not rocket surgery.” No it certainly is not. Oh the joys of Christmas. For me it’s the lead up that excites me; only 206 Days to go. The excitement is palpable I tell ya!!! But sometimes you just cannot wait, and I doubt anyone could wait to crack this ripper on Christmas day to smash it down with a dozen or so freshly shucked oysters; Oh dear NO-NO-NO!!!! And that ripper would be the Benjamin Leroux Bourgogne Blanc 2016 which I recently tasted along with most of Benjamin’s 2016 Burgundies. This one for me was the highlight of the day. With fruit mostly sourced from Puligny-Montrachet, the wine on the nose offers lovely creamy notes followed by bright citrus and stonefruit; I picked up nectarine and tangarine. The palate has a quick whack of green apple followed by plenty of length with the citrus and stonefruit flavours dancing over my tongue. Just a stunning wine. I seriously doubt that this will still be here, even more so that it is currently by the glass at $17 with the bottle price at $68. What a ripper indeed.